Vibration White Finger, also called hand-arm vibration syndrome (HAVS) causes symptoms in fingers, hands and arms, as a result of using vibrating tools. The name now commonly used is HAVS, as other symptoms may occur in addition to white fingers. Vibration White Finger is a variant of Raynaud's Phenomenon. Raynaud's phenomenon is recurrent spasm of the arteries supplying the fingers, toes or other extremities, which causes them to go bluish-white, cold and very painful. It’s thought to affect as many as 10 million people in the UK. The trigger for an episode is usually either exposure to the cold or mechanical stress (such as intense vibration, for example from using a drill). This causes the arteries to go into spasm, shutting down and therefore closing off the blood supply to the extremities, so causing the symptoms. These usually affect the fingers and toes, but the ears and nose can be involved too. The skin turns white, then blue (for some people) before eventually going bright red (after a matter of minutes or sometimes longer) as the spasm fades and the blood supply is restored. This final stage is accompanied by severe pain and occasionally numbness or tingling. There is often a clear demarcation line between affected and non-affected areas. Symptoms are usually completely reversible but in severe cases there is permanent damage and ulceration of the tissues. People with Raynaud's may have to avoid everyday activities for fear that exposure to temperature change will trigger symptoms. Going out in cold weather is an obvious example. But just getting something from the fridge or holding a cold drink may be all it takes to trigger an attack. 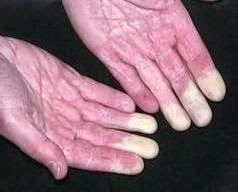 Primary - The most common form with no apparent cause (known as Raynaud’s disease). Secondary - This is when it's associated with an underlying disease, especially autoimmune conditions (such as scleroderma, rheumatoid arthritis, Sjogren's syndrome or systemic lupus erythematosus), and certain infections, tumours and drug treatments. When a person first develops Raynaud’s phenomenon it is important to rule out such underlying causes. The exact mechanisms involved in the condition are not clear but it’s likely that many different factors may play a part in different cases. For example, research has identified abnormalities in the blood vessels, blood clotting system and the nerves and chemicals which control the dilation or constriction of the blood vessels. Raynaud's affects nine times as many women as it does men. It can be hereditary - when this is the case, it tends to be a milder form. It's quite common in teenagers, although many are only affected for a few years before it disappears when they're in their early 20s. People who experience mild attacks usually only need to ensure they avoid temperature changes and wear warm clothing to protect them from the cold. Many people find having portable heating devices, such as warmers for gloves, socks or pockets, invaluable. If other triggers can be identified (such as certain medications or use of vibrating tools), these too should be avoided. In secondary Raynaud’s phenomenon linked to a particular disease, treatment will be determined by the underlying condition. Regular exercise is a good way of stimulating the circulation. Eating regularly throughout the day helps, in particular hot meals and drinks. Not smoking is essential. There are many simple and imaginative ways people with Raynaud's can make life easier for themselves. Wearing oven gloves when using the fridge or freezer, for example, or putting a foil-wrapped baked potato in each coat pocket when going out. In more severe cases, when attacks are frequent, prolonged and prevent people getting on with life, a variety of medicines can be used to help improve circulation and keep the blood vessels dilated. Some people also benefit from taking evening primrose oil, ginger, garlic, and vitamins C and E, although there is little scientific evidence to support these treatments. If symptoms don’t reverse and the extremity becomes ulcerated or gangrenous, urgent review and treatment in hospital is needed.